Last night I came home with both my laptops since the plan was for me to cover for one of my reps who went to visit his mother for the weekend. My main laptop is my Powerbook G4, and I also have a Dell Latitude D610 which I use for the very few things that the Mac can't do. One of those things is accessing the application we use to remotely get our voice mail and redirect phone calls. My normal home office was completely empty when I got home. Due to some damage from a pin hole in a corroded pipe, my office refuge for the last 17 years got new carpet and paint last week which mean that all the computers, network, printers, and office equipment had been packed up. We had been getting along relatively well on Glenda's iMac and my Powerbook, though the Airport card on her iMac had died for a third time. That meant she was on our back-up DSL network which can be as slow as molasses by times. Somehow the Dell laptop had lost the key to the wireless network, and I spent considerable time typing in excessively long strings of characters only to have it fail to connect to the speedy wireless cable modem network. I finally plugged it into the DSL network only to find that the voice mail app wasn't really usable at our snail paced DSL. My Vonage phone also wouldn't work on the DSL so I ended up using my cell phone for the evening calls. I knew that all this meant a trip to Best Buy to buy a new router and switch since my old one had died when dismantling everything for the sprucing up event. At lunch when I got back from Best Buy, I hurriedly dragged the smallest usable table I could find into the freshly decorated room and started creating a new office. When I was done and my oldest daughter Erin saw it, she said the table looked like it had hair. It was actually amazing how many wires you could string together in a few minutes to create an instant office. 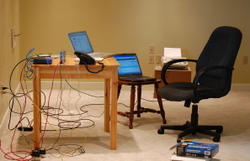 All the cables were generated by a cable-modem, router-switch, an Airport bay station, two computers, and a Vonage IP phone. The fax machine and answering machine actually seemed like an afterthought. It probably took less than thirty minutes to get it all working. Once the Dell got plugged into a wired network, the voice mail application worked fine. The Mac actually stayed on a wireless network since I could only rescue a limited number of Ethernet cables. I could eliminate a little of the cable clutter by combining some functions into one box, but I've found some usefulness in separating functionality into different pieces of hardware. I've always like Swiss Army knives but I've never been a fan of the Swiss Army knife school of equipment. Get the right tool for the job to make sure it does the job correctly. I wouldn't go fishing for Brook Trout on a tiny mountain stream with the same gear that I use for surf fishing on the Outer Banks. I would have to be pretty desperate to carve my Thanksgiving turkey with a Swiss Army knife. There's no doubt we're a wired world, and that those connections are of huge importance to our lives. More and more companies depend on remote communication to do business. Only the bigger companies can afford hauling together employees spread across the country. Even when they do get together it's a cause for a smile.